Having been performed once in 1996 (the only time since 1991), "MAN OF PEACE" had three appearances in November 1999 (see video of the Amherst performance from 1999 below), amid other rare gems on that tour. 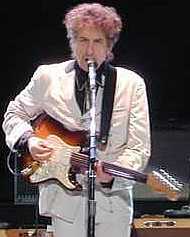 It had not been performed since then, when, ten months later, Bob started his fine European fall tour in September 2000. Tension rose within me as I saw it on the cue sheet in Glasgow with my binoculars as the first choice in slot number 18. 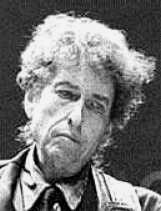 Bob however chose to play the third choice, "TO BE ALONE WITH YOU" (the second choice was "EVERYTHING IS BROKEN", which he then performed in Birmingham). In Newcastle, two days later, he finally pulled out "MAN OF PEACE", this grave warning about the craftiness of the father of lies, in the number 16 slot, where H61 was performed in the four previous shows. I would say "MAN OF PEACE" rocked at least as much. This is probably not the only reason why he keeps on singing challenging lyrics like "MAN OF PEACE". I think Bob Dylan believes what he sings in those songs, and that the biblical viewpoints conveyed on stage are his own. The devil … was a murderer from the beginning, and has nothing to do with the truth, because there is no truth in him. When he lies, he speaks out of his own character, for he is a liar and the father of lies. Now after Jesus was born in Bethlehem of Judea in the days of Herod the king, behold, wise men from the east came to Jerusalem, saying, "Where is he who has been born king of the Jews? For we saw his star when it rose and have come to worship him." When Herod the king heard this, he was troubled, and all Jerusalem with him; and assembling all the chief priests and scribes of the people, he inquired of them where the Christ was to be born. They told him, "In Bethlehem of Judea, for so it is written by the prophet: " 'And you, O Bethlehem, in the land of Judah, are by no means least among the rulers of Judah; for from you shall come a ruler who will shepherd my people Israel.' " Then Herod summoned the wise men secretly and ascertained from them what time the star had appeared. And he sent them to Bethlehem, saying, "Go and search diligently for the child, and when you have found him, bring me word, that I too may come and worship him." After listening to the king, they went on their way. And behold, the star that they had seen when it rose went before them until it came to rest over the place where the child was. When they saw the star, they rejoiced exceedingly with great joy. And going into the house they saw the child with Mary his mother, and they fell down and worshiped him. Then, opening their treasures, they offered him gifts, gold and frankincense and myrrh. And being warned in a dream not to return to Herod, they departed to their own country by another way.